Description: Three former Conrail GP's between assignments at Port Newark yard. The PRR 2932 was sold off in 2002. Description: F773-13 slips into acca from collier with some classic EMD's for power. Description: I love every minute of getting pics of this GP38...it won't be around forever and it sure sounds neat with it's non-turbo'd engine! 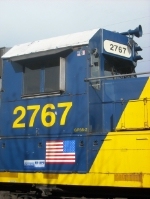 Description: Former Conrail GP38-2 8178 now CSXT 2767 proudly displays a larger than normal Amrican Flag on it's sub base in Fairburn Ga. Description: CSX GP38-2 2767 stands gaurd at the south end of the Dog House and will be shoved in the clear by A713. The unit will be headed to Atlanta for future assighnments else where. Description: You'd think this was a 3 mile train with all this power on it. It was long, but not 3 miles; and, according to what I heard only two of the engines were on-line. As I often do, I was checking the Belle Isle siding first thing this morning, I was on my way home when I caught this train leaving the west end of that very siding at CP296! I got ahead of them in order to catch them here at 08:00. Description: CSX 2767 SIT'S TIED DOWN AT THE MONTGOMERY YARD. IT'S GETTING HARDER AND HARDER TO FIND THESE PAINT SCHEMES. Description: BOTH UNITS SIT TIED DOWN AND WAIT FOR WORK.